7-11 in the valve center, 12-14 at the ends. Valves are weakly arcuate. The dorsal margins have two broadly rounded undulations. In larger specimens, apices are capitate and obtusely rounded. In smaller specimens, apices are subcapitate. The ends are 6.3-10.2 µm wide. Helictoglossae are visible on the ventral margin, at the apices. Small undulations are present on the ventral side. The raphe curves onto the ventral mantle toward the center valve, with proximal raphe ends positioned at the small ventral undulations. Transapical striae are nearly parallel, becoming curved near the ends. 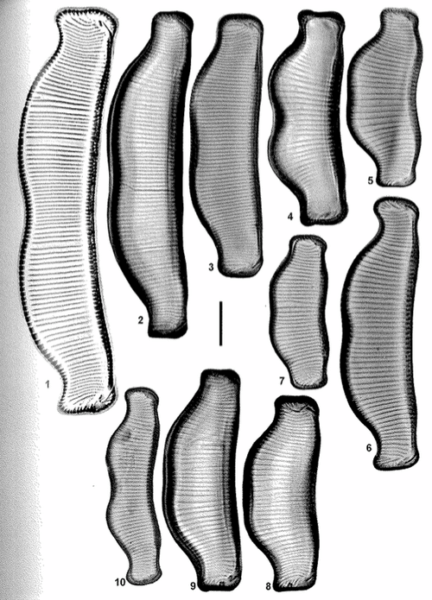 Shortened striae may be present in some specimens, near the dorsal margin. A narrow sternum is present near the ventral margin, near the apices. Areolae are fine and number 26-30 in 10 µm. 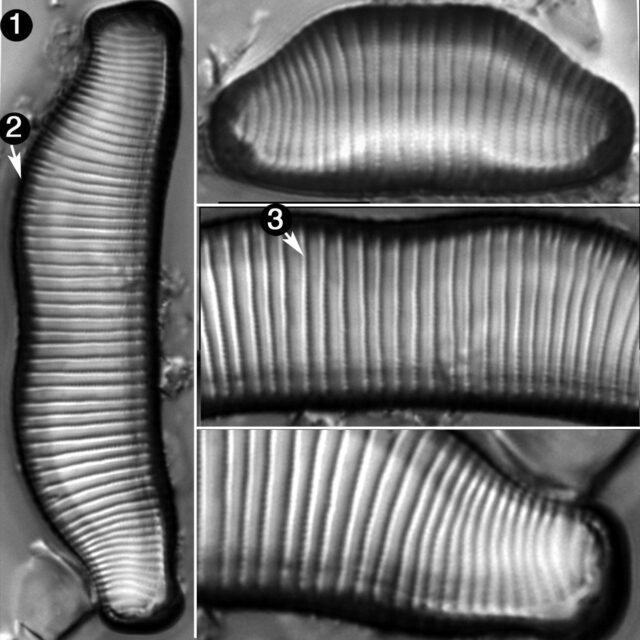 In North American specimens, the areolae are less dense than those documented in the original description (30-32 in 10 µm). Due to the recent designation as a species by Lange-Bertalot (2011) and it's likely miss identification as E. praerupta var. bidens and E. bidens, the geographical distribution and ecological niche of E. superbidens is not yet well understood. 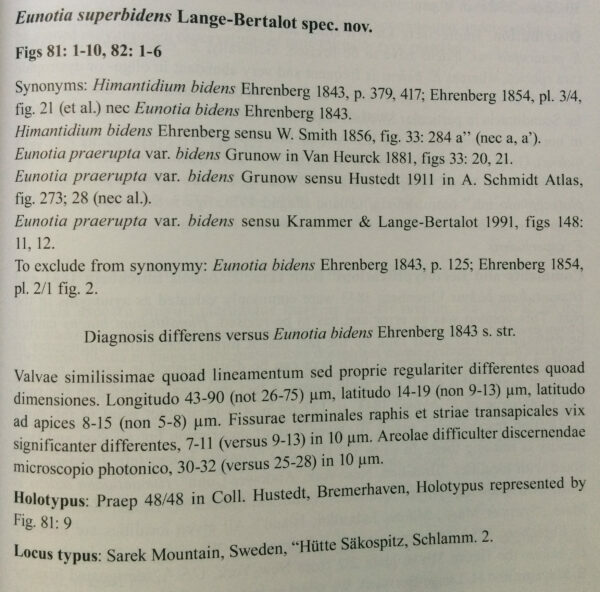 Burge (2014) found E. superbidens occurring in less than 30% relative abundance among the epiphyton and benthos of cypress-tupelo wetlands with: 22.2–27.4 C, 5.6–7.4 pH, specific conductivity 71.2–834.0 µS/cm, 8.1–321.0 NTU, DO 0.1–7.7 mg/L, NO3-N 0.01–0.3 mg/L, NO2-N <0.001– 0.1 mg/L, orthophosphate 0.02–2.08 mg/L, and TP 0.11–3.93 mg/L. Other common species were Eunotia bidens, E. bilunaris, E. formica, and E. metamonodon as well as species of Gomphonema, Navicula, Nitzschia, and Pinnularia. Valves are large and dorsi-ventral, with broad biundulate dorsal margins. Transapical striae nearly parallel, becoming more dense near the apices. The ends are capitate, especially in larger valves. 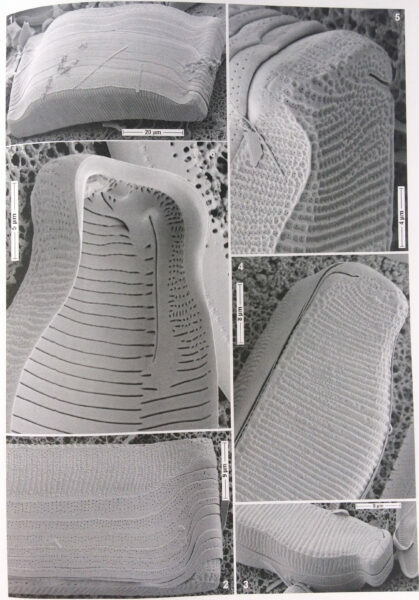 Small undulations are present on the ventral side, which coincide with the proximal raphe ends.